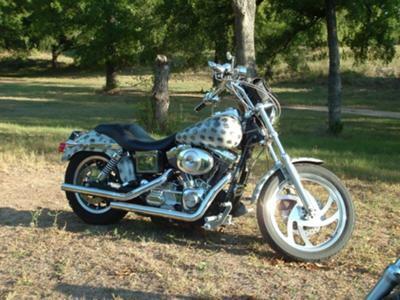 I ride a 2002 Dyna Low Rider with a custom black and silver snow leopard paint job. I've got Vance n' Hines 2 1/4 inch straight pipes with no baffles - so it's extremely loud and obnoxious! 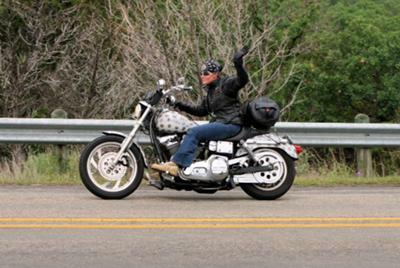 I've been riding since 2000 and I'm Sergeant-at-Arms of the American Legion Riders Post 333 based in Grapevine, Texas. We are a veteran's motorcycle group. I spend as much time as possible on my bike, and my 8 year old daughter has been riding with me for the past 2 years - she's my little biker-buddy! Riding my Harley is such a core part of who I am. I love the camaraderie I share with my friends as fellow riders and veterans and the friendships and experiences we have shared, both on the road and off are an integral part of the fabric of my life. I rode my bike until I was 7 months pregnant with my daughter, and I rode on the back 8 months pregnant. My first ride after I had my daughter was when she was 10 days old. I could not stand being off the bike! I've seen many more women riders over the last few years, and that's a great thing! Love this photo. Love the bike. Love the attitude! It looks like it was made for you! Thanks for sharing your story. That's a really cool story - thanks for sharing - I feel inspired! I have to agree, very inspiring story, especially for those of us who are new riders. Stay safe out there. By the way...I love your paint job, that's a beautiful bike. Very inspiring story. I read about so many men selling their bikes because they have kids and no time to ride and look at you!!! I can't wait to put my son on the back of my bike. He's only 5, but I'm hoping in a few years he will be ready. I love the paint job!!! Glad to see you are sharing our sport with your daughter. Hope she takes on to the road on two wheels when she is of age. We need more females on the road. Love the paint job! Keep ridin' girl! Now THAT's a cool custom paint job! Kudos to you for showing us that being a woman, and a mom, does not exclude us from enjoying the freedom of biking. I salute you and your club; and, sincerely, thank each of you for your service.